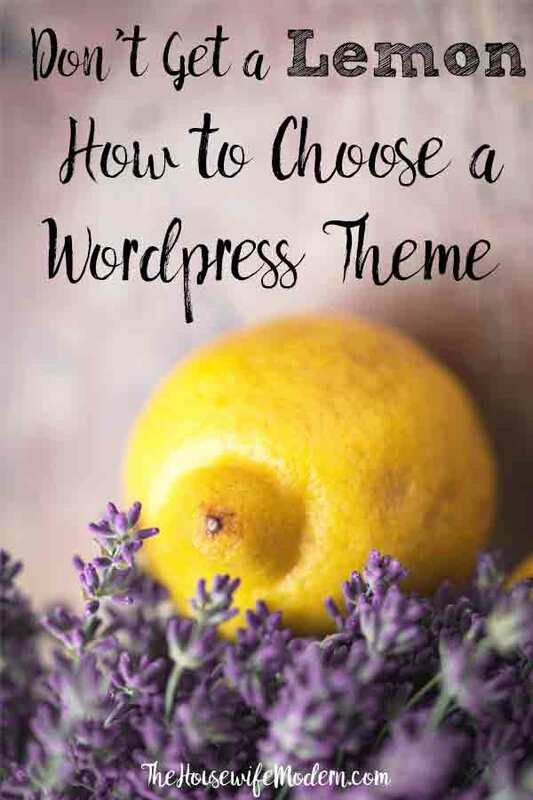 Which theme to use is one of the most important choices you’re going to make about your website. There are thousands of themes to choose from. And they’re all different. There are also parent and child themes. And stand-alone themes. Are you feeling overwhelmed yet? If so, you’re not alone. I remember picking my first theme (which I did very poorly, in case you were curious). Picking my second one, I did a bit better. It was my third time before I got smart and picked a theme the right way. 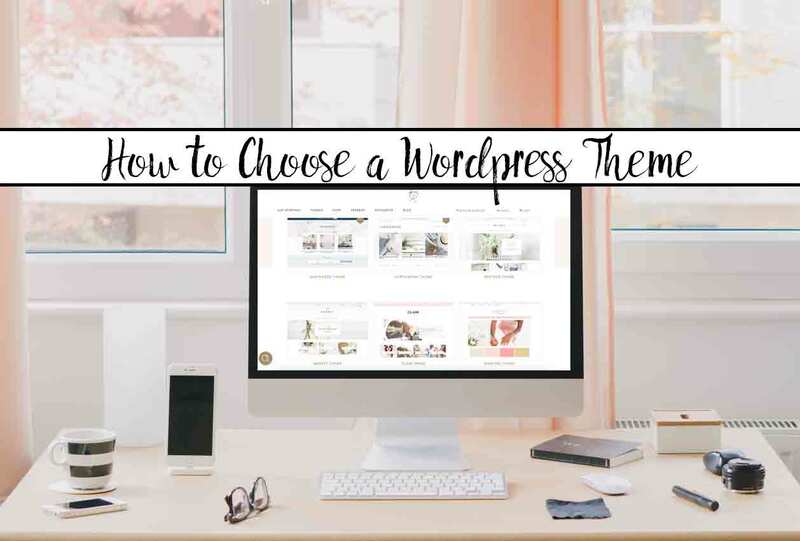 What is the right way to choose a theme for WordPress? The right way is figuring out exactly what you want out of a theme. What features you need for YOUR website. Then finding a theme that incorporates those. In case you’re curious, the wrong way is picking a theme because it looks good or is supposedly for your niche. For example, there are themes out there just for food bloggers. I made the mistake of buying one. Because I had recipes on my site. The problem? This website is about a lot more than food. And the theme I purchased had no features to support a wider variety of posts and pages. The following post about choosing a WordPress theme is long. Sorry about that. But I want you to make a smart choice before you invest your money. If you have other questions about how to start a blog, I did an entire post on “How to Build a Blog: The Ultimate Guide.” You might also find the “Blogging Resources” page helpful! If you’re wondering whether to go with a free theme or to invest in a premium theme, you’re not alone. It’s a choice almost every blogger has to make. 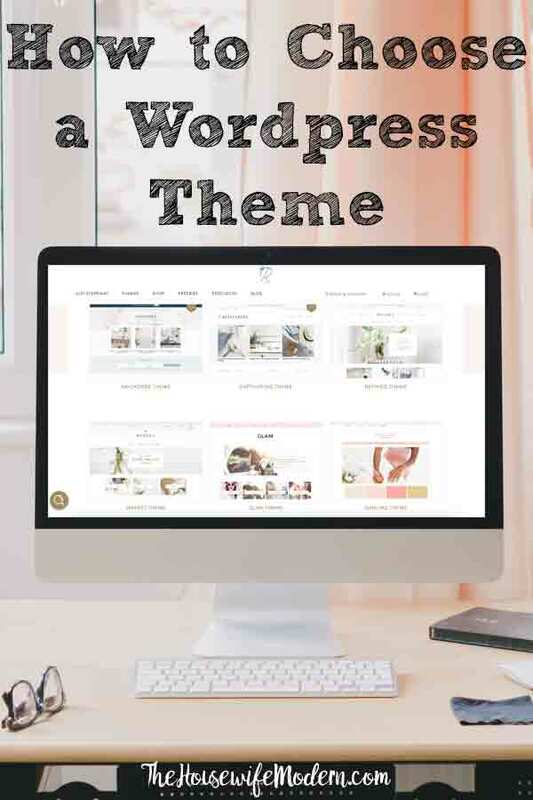 To make it simple: unless you’re a hobby blogger with no interest in income, you’re going to want a premium theme. And even then, you might want to invest in a premium theme. What are the differences between free and premium WordPress themes? Here are some pros and cons of each. • Free themes are (obviously) free. Premium themes can range from about $15 to up to $200. If you pay more than that, you might want to investigate getting a custom-designed one since you’re making such an investment. • Free themes are usually of more simple design. This can be a pro for those who aren’t tech savvy. But also means there is less you can customize. Thousands of other people are going to have websites that look almost identical to yours. • Free themes have little to no support. This is a major con. Premium themes have required support for a certain time period. Many come with lifetime support. Check the theme details. • The author of a free theme can abandon it at anytime. They have no obligation to continue to update it or worry about security issues that may come up. In the long run, this leaves your site very vulnerable. And don’t think you’re too small to get hacked. I thought so too….I was wrong. • Though not always true, in general, free themes are of lower quality. They’re usually developed by single individuals honing their design skills. I included this up here because you’re going to want to browse through some of these options while you apply the rest of the post. For example, after these recommendations, you’re going to be deciding what you want your theme to do. Without looking at what themes CAN do, it’s kind of hard to start defining what you like and don’t like. (haha). If I’m recommending them below, it’s because I’ve had positive feedback from others about them. I’m not recommending anything that I haven’t had blogger friends rave about. That’s why there are only a few companies listed below. I am specifically NOT recommending Theme Forest or Themify. I’ve heard complaints about things ranging from security loopholes to some themes being of extremely low quality. That isn’t true for all the themes on their sites and companies change over time (they may get better). But I’d rather you were safe than sorry. After you’ve decided on free or premium, you now need to decide what you want your theme to do. Having a beautiful theme that isn’t functional for your needs is doing a disservice to both yourself and your readers. If you need to show off photos, the way the theme plans out the galleries is very important. If you are selling products, the design of the product page and which cart it integrates with is important. Etc. • Does the theme fit your brand? A feminine, light theme might not be the best option for a lawn-care business. Even if you love it. • Do you need a shop page? If so, do you like the one on the demo theme? Does the theme work with different eCommerce sites (such as WooCommerce, SendOwl, etc)? Is it easy to add items to the cart and to find the cart after the customer is finished browsing? • Do you need a portfolio page? If so, do you like the one on the demo theme? • How many menus are on the demo theme? Are you going to need both a top menu and a header menu? If so, are both offered? (To see what I’m talking about, scroll to the top of the page…as you can see, there are two menus focusing on very different areas on this website…if I were limited to one menu, this would be confusing and very crowded). • Do you want multiple menus? Or is one menu ideal? • Do you require custom colors? Or are are you okay with the preset options? • Do you require custom font? Or are you okay with the preset option? • Can you customize header/logo area? Do you want to do so? • Check the pages offered. Do you like the sidebar option page? Do you like the full width page? Is there something in particular you are looking for? Is there a particular design you see that you really like? • Check the ‘read more’ where the post excerpts show up. What do you want yours to look like? • Main column content- how wide do you want it? Set to the left? The right? The center? • Sidebars- do you want no sidebar? on the right? on the left? • Header- How big of a header do you want? Do you want a big header that doesn’t allow content above the fold? Or a smaller header that allows you to showcase content? • Footer- Do you want footer widgets? A highly customizable footer? Do you want a lot of area or minimal? • Do you need a drag & drop builder? Does this theme include that? Take some time and write down what you like and don’t like. Maybe even sketch out- it doesn’t need to be pretty- what your ideal site design would be. Whew! You’ve decided on free or premium. You’ve started to decide what you want your theme to do. You’ve looked at some themes and probably started to gravitate towards a few. Before you make a solid choice, here are some do’s and don’t to keep in mind. • Do make sure it has responsiveness/is mobile responsive– this is an absolute MUST these days. My website used to be almost 100% desktop traffic. Now almost 40% is from mobiles. I can’t believe that! • Don’t get all worried about frameworks and child themes and the terms. Unless you’re building websites (and if you are, you’re not visiting my site looking for answers on buying a theme), you’re going to buy: 1) a stand alone theme that does what you need -or- 2) buy a child theme that will make it very clear to you that you need to buy a framework for it. If you want a very simple explanation: imagine your website is a car. WordPress is the engine driving it. Framework is the frame and body of the car, child themes are the paint job. But a stand-alone theme is the frame, body, and paint job all bundled together. Exception: if you know you’re going to change your theme multiple times, go with a Genesis framework and pick a child theme. • Do check and see if the theme comes with “dummy content” or “demo content”. -If it doesn’t, your theme might not look anything like their demo theme. You’ll have to build it using the tools they give you. -If it does, you upload the dummy content…aka- the content they’re showing in their sample and replace it with your own. So if comes out of the box looking like the demo. -If you can’t find a solid answer on the page selling the theme (it should be listed under features), ask others who have purchased it. •Do check out the FAQ/support area of whatever company you are buying. A simple search should be able to answer most of your questions. •Do check if the fonts and colors are highly customizable. The demo theme looks good. But unless you want to stick with that color scheme and those fonts forever (and you probably won’t), check and see what it allows you to customize. •Do check the forum (if they have one). See if there are responses to any questions and how long it took them to respond. If they don’t have a forum, check and see how you contact them. You want to know if you’re going to be submitting a support ticket, sending e-mail, or whatever. If you can’t find a way to contact them…avoid them. •Do a quick Google search searching “THEME YOU’RE CONSIDERING reviews”. See what people are saying. This will also show you any red flags. • Don’t trust everything you read. Remember that some people are less tech savvy than others. A lot of complaints come from people who honestly didn’t try to fix the issue/customize the theme…they just complained about it or didn’t understand how to use it. •Don’t get features you don’t need. All that extra coding just slows down your site. •Do try to look past the colors and look at the layout of the theme. While colors and images catch your eye (and are supposed to), those you are going to be changing. Make sure you like the fundamental layout. Maybe even sketch out what you’re looking for- it doesn’t have to be pretty- and see if you can find a theme to match. •Do dig into their demo site. Don’t just look at the home page. Look at the various page options, play around with the options. Make sure you like what you see. • Check the theme with a speed test. Go to: https://gtmetrix.com. Then input the url address of the demo. Check out the score and what there were issues with. Make sure you compare a few different themes!